Obviously it is not in LNWR days. But it looks like an LNWR location. So where and when is it? And what is the engine doing? Has it arrived? If so, where from? Or is it about to depart, in which case where to? Any more information? LMS �Jubilee� 4-6-0 No. 5717 �Dauntless� carried the 1936 block style insignia from new in July 1936, probably until its first heavy general overhaul in 6/39. Its sheds were initially Blackpool, then Southport from 9/39. So the location is probably somewhere on the LYR or the Preston and Wyre joint line, perhaps Fleetwood, as the corrugated-arm signal looks LNWR - although LNWR-pattern signals were erected in LYR territory by the LMS for some years after the grouping. The platform is �modern� with concrete edging, implying an important station. Judging by the amount of coal in the tender, and the fact that it is blowing off fiercely, and the injectors are working vigorously, it is going, not coming. My only comment � 3rd and 4th rail electrification? Kensington olimpia was one of the places where inter-regional trains changed over engines. 5717 would have run light engine from Willesden shed to work this train back to the north west.The fireman will be trimming the coal in order to put the fireirons back on their brackets. The houses in the background are on Sinclair Road, [bing maps, birds eye view] the platforms and lines have changed from in the mystery photo. Nice work, Alan! Yes, it's definitely Kensington Addison Road, which was renamed Kensington Olympia in December 1946. 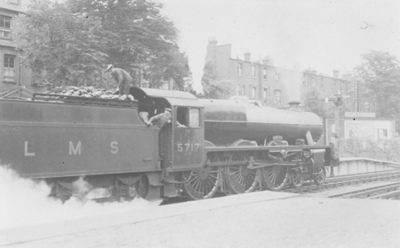 According to the RCTS book on the Jubilee class, No 5717 seems to have carried its original sans-serif number and lettering until repainted in the black LMS livery in November 1947, but the date of the photo is almost certainly pre-war because of the clean red engine. The wartime restrictions on railway photography (as well as the total absence of camera film in the shops) also suggest a pre-1940 date. Yes, it�s definitely Kensington Addison Road. 5717 is in one of the Down North Bays, where the Motorail terminal later was. (Up was & is from Willesden to Kensington & Latchmere Jc).The LNWR signal was the Bay Starting signal for North SB. No doubt waiting to go on the front of a train from somewhere South of the Thames, once the SR engine has come off.